SIL clutch outer basket with 46 tooth sprocket. 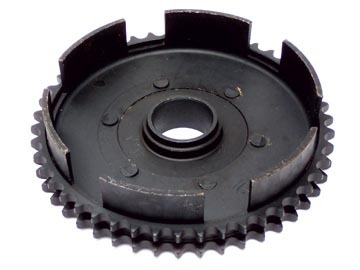 An excellent replacement for any worn out 46 tooth Italian, Indian, or Spanish sprocket, including the spring loaded baskets found in many Italian Li and TV models up to about 1963. These baskets are known to fail, sometimes sending pieces of broken springs into your transmission. Works with standard 80 pitch chain and 15 tooth sprocket, or 81 pitch chain with 17 tooth sprocket. Do not use with needle bearings, instead use bronze bushing #1222.B.